← The Big Dig of 2008! Or, The Craziest Place I Ever Turned up a Vintage Skittles Pack. Yipes! Stripes!! It’s Sour Bites!! Today I’m going to cover a wonderful little product that was produced by the Beech-Nut company from the mid-1960’s likely until the early 80’s: Sour Bites. 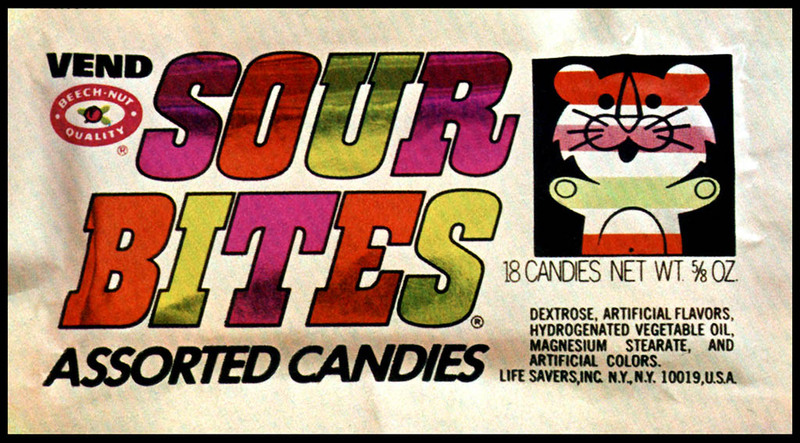 Sour Bites were a bit like Sweetarts, though they incorporated fun animal mascots onto their packaging and even the candy itself. Offered in foil packages, just like the Sweetarts of the day, they were originally available in single-flavors as well as assorted variety. 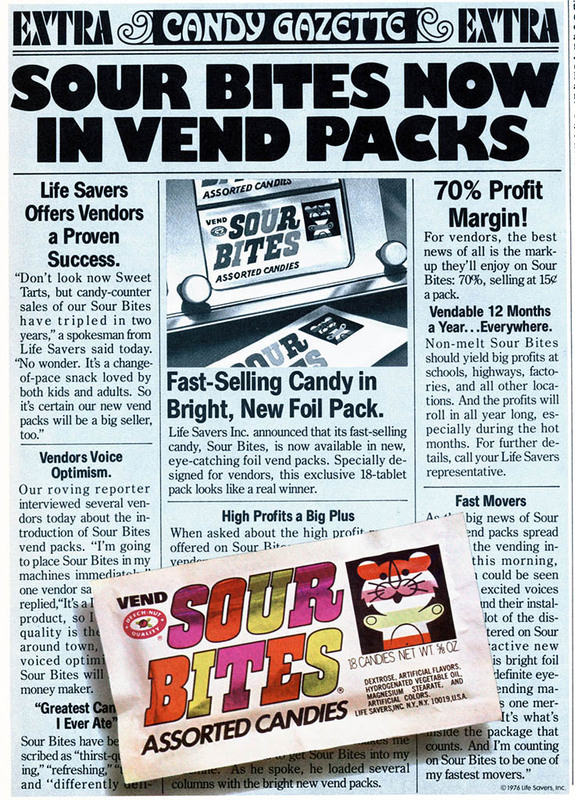 Unfortunately, I’ve never been able to track down a vintage Sour Bites package, so today I must rely on the scattered bits of reference that have been turned up over the years. 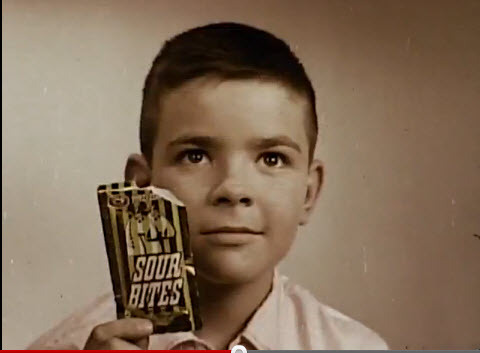 A washed out film reel of an original 1960’s Sour Bites TV commercial has been online for a few years, and within it, you can see a couple of the different single-flavor packs. Each one sported a different animal. Sour Bites commercial shot – Sour Bites with horses? Sour Bites commercial frame – Sour Bites with mice? 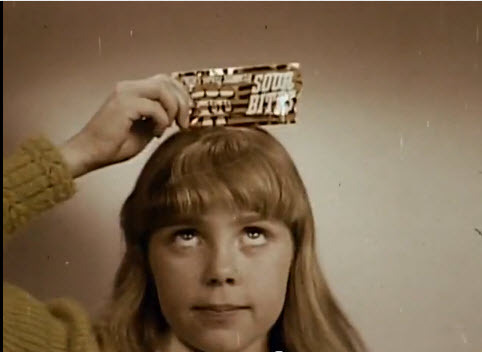 I have to wonder how many variety of foil packs they produced back then? They show a candy piece with an elephant mascot on one, so I would guess that was another of the animals. So it would seem that Fruit Stripe Gum and Sour Bites were somewhat connected through much of Sour Bites lifespan. Sour Bites animal mascots were always striped, so I wonder if that’s where the Fruit Stripe Zebra got his look? And that’s really everything I’ve got for Sour Bites. 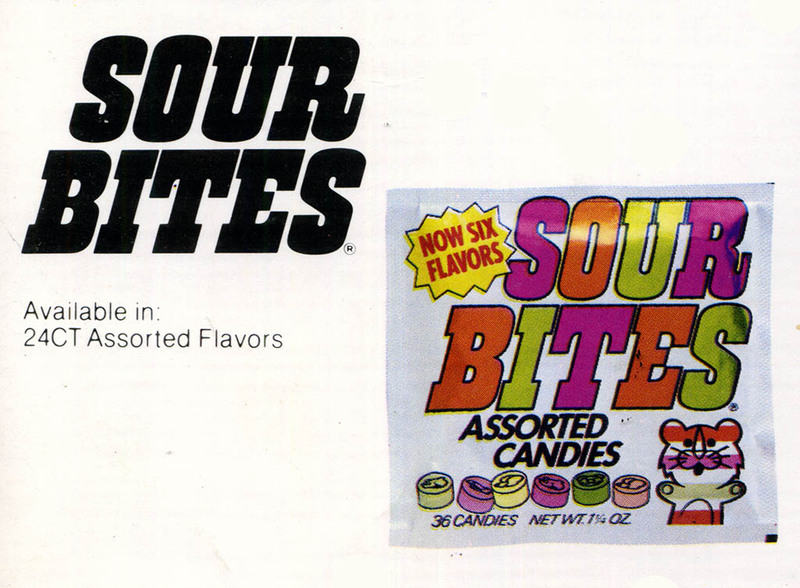 If anyone out there finds something I don’t have or has an actual Sour Bites package, please get in touch, as I’d love to include more about this brand in a future post. And that’s everything for today’s post. I hope you’ve enjoyed this look back at the wonderful forgotten treat that was Sour Bites. See you next time! This entry was posted in 1960's, 1970's, 1980's, Sour Candy and tagged 1960's candy, 1970's candy, 60's candy, 70's candy, Beech-Nut, candy collecting, candy collection, candy collector, candy wrapper collection, candy wrapper collector, collectible, collecting candy, confectionery, confections, mascots, packaging, sour, Sour Bites, Sweetarts, sweets, vintage candy wrapper, wrapper. Bookmark the permalink. 12 Responses to Yipes! Stripes!! It’s Sour Bites!! The original mascots of Fruit Stripe gum were the elephant, mouse, horse and tiger. So they were used as the mascots for Sour Bites. 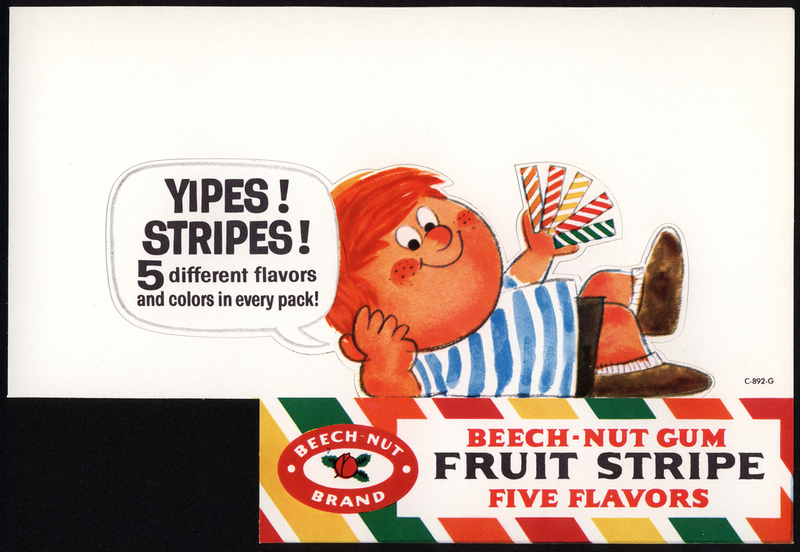 Fruite Stripe gum would then take on the zebra as their mascot but the original 4 remained active on the Sour Bites candies. Thanks for posting all of your information regarding Sour Bites. This was my FAVORITE candy and was extremely distraught when I saw them go on sale in the early 80s. I used to buy the entire box at the store and cherish them. They were the best! When I moved to NYC I saw that they had sold the trademark to Pillsbury and they no longer made them. Made me incredibly sad. Hope someone decides to manufacture them again! At least Regal Crown Sours are coming back! Thanks for posting this. I remember enjoying this treat, but I just could not remember the name of it. I could picture the candy and the wrapper, though. I also could “taste” the product in my mind. This may be confabulation on my part, but the taste was more tart than sweet. The bites indeed were sour. It’s great to put a label and a picture to my fond recollection. The tip of my tongue became numb after my hundredth failed attempt to recall the name of this candy, so your blog post was a life saver. I have been racking my brain for years trying to figure out the name of this wonderful candy with what I remembered to be a tiger on the front of the foil package! I loved these “sours” as a child!! I believe that they trigger the most nostalgic and fond memories of my youth. 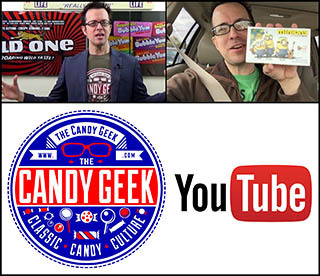 I cannot say enough and I hope that these candies will be brought back in the style Jake for him just as so many other candies have been. Can we all get together and send letters to beech nut or Lifesavers? My grandmother used to buy me a sealed box of these every year for my birthday until she passed away in the early 1980’s. Definitely my favorite candy growing up! I too have been trying for years to remember the name of these candies. I really wish they would bring them back. They could market them at zoos. I want them too!!! Been looking since 1980 when I found a whole box at a gas station and hoarded them as long as possible. I love the layered colors. Who is willing to spearhead an effort to bring them back? If people are still looking for them 30 or 40 years after they are gone, how much new interest could possibly be sparked. Do we have enough interest to start a petition, or are we just the precious few who know a good thing when it’s gone? Brings back great memories! Wish they would be back, in the original formula! 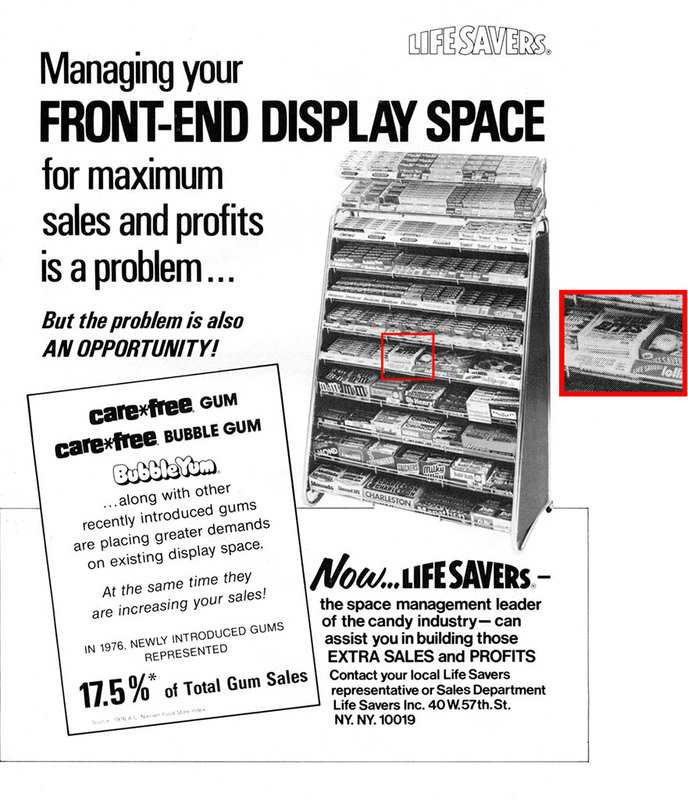 I’m with Tracy on this one…in the late 1960’s, I also rode my bike with a banana seat, high handlebars and knobby tires to “Jake’s”, a convenience store a couple miles from my house to buy packs of Sour Bites…THE best candy EVER! BRING BACK SOUR BITES…and with the original recipe!